Jeremy McKenna on his FLUX Board. It’s late afternoon on Merrimack Street and a figure moves swiftly ahead of crowds walking. Jeremy McKenna isn’t running. He’s gliding. And under his feet is one of the year’s most wanted holiday gifts according to top tech bloggers and gear gurus. “It’s an easy way to get around,” says McKenna, who pivots, spins, rolls forward and backward in smooth, fluid motion on the futuristic board. 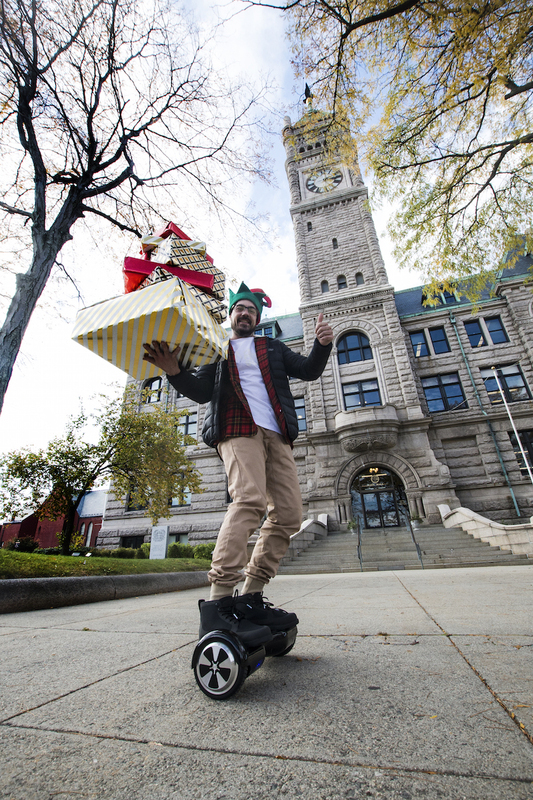 A cross between a Segway and a skateboard, the FLUX Board, designed by McKenna, 30, of Nashua, and owned by a group of New England-based entrepreneurs, is the closest thing to a hoverboard we’re going to get in 2015. Remember when Marty McFly alters a wheeled wooden soapbox crate and invents the skateboard in the original Back to the Future movie? If he’d done the same thing to a Segway, it would look a lot like a FLUX Board. 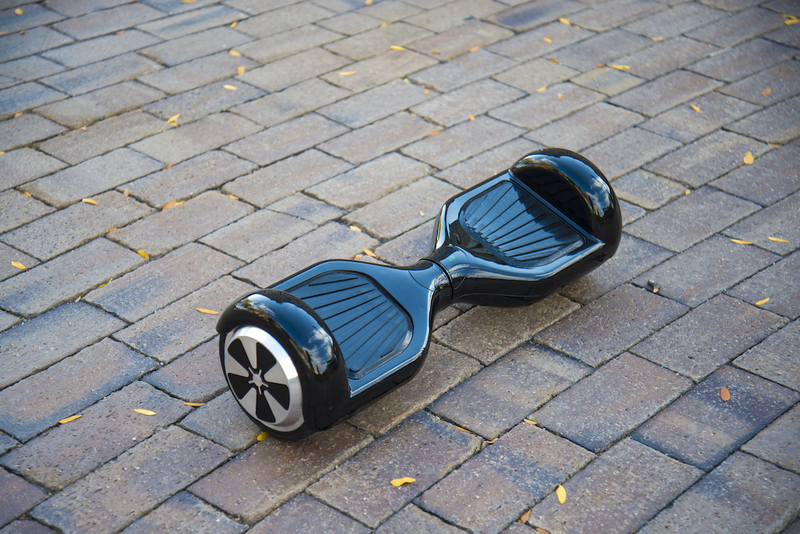 The FlUX isn’t the first electric self-balancing board to hit the retail market. But it’s much easier on the wallet than some of its major competitors, including the IO HAWK that retails for around $1,800, and the PhunkeeDuck for around $1,500. The $600 FLUX Board launched in October at McKenna’s downtown Lowell clothing boutique, Persona (51 Market St.), and quickly sold out. From November through January, FLUX Boards will also be sold at the Pheasant Lane Mall (outside the Apple store) and at Merrimack Premium Outlets. McKenna, a longtime skateboarder, first spotted the device at tradeshows. But the luxury price tag was still too high for most middle class consumers. “I did some research and found that we could make the same quality product at a more affordable price for the average consumer,” he says. The “Lexus”-priced boards nearly broke the Internet this year when celebrities from all walks, including Justin Bieber, Nicki Minaj, David Ortiz, Wiz Khalifa, Kendall Jenner and Jamie Foxx posted pictures of themselves, or were spotted, riding one. The board weighs 22lbs and is controlled by leaning and tilting the body thanks to sensitive sensors built into each foot panel. Once charged, it can travel between nine and 12 miles, at a speed of up to six miles per hour, depending on the terrain. Once riders get over the initial shaky knees and wobbly legs to find their center of balance — about five minutes — it’s a breeze to maneuver. A longtime skater who, for a blip in time, gave professional snow boarding a whirl, McKenna admits the Flux Board will never permanently kick his skateboard to the curb.